Congress leader P Chidambaram's son Karti Chidambaram has clarified that his only connection with INX Media, owned by Indrani and Peter Mukerjea, was that his friend was its auditor. 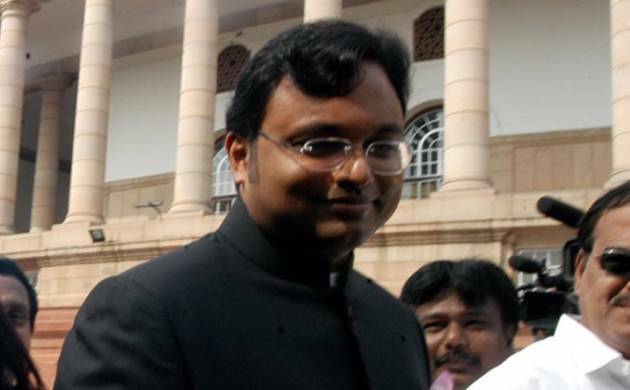 A file photo of Karti Chidambaram. "A friend of mine is the auditor of that television company and it is the only connection I have with that firm," he said referring to the CBI naming him as an accused in the INX media case. Karti, who is now in London, said in a Facebook post that CBI had "unnecessarily" included his name in the case. On May 15, CBI had filed an FIR against Karti, Indrani and Peter Mukerjea on charges of criminal conspiracy, cheating, receiving illegal gratification, influencing public servants and criminal misconduct. According to the investigative agency, Karti had allegedly received money from the media firm owned by Indrani and Peter Mukerjea to scuttle a tax probe, a charge denied by him. The Enforcement Directorate had on Friday registered a money laundering case against Karti and INX Media for alleged irregularities in the Foreign Investment Promotion Board's (FIPB) approval for the company to get Foreign Direct Investment. Karti, who posted a facsimile image of his interview to a Tamil media outlet, said though this was a "corruption case, there are no details about which government official was bribed, they have just mentioned some unknown officials." "I know how to handle this legally," he said and asked why the officials who raided his premises had "not come out openly about what was seized from my house and what evidences they had got." "Only if they had got anything, could they be able to spell that out," he said, apparently claiming that no seizure of evidential value was made. Karti also said that he had not received any summons from CBI to appear before it in Delhi. He also uploaded a photo of his with Richard Evans, eminent historian and president of Wolfson College, University of Cambridge.